The Federal Airports Authority of Nigeria on Tuesday cleared the air over a purported bomb scare at the Murtala Muhammed International Airport, Lagos, saying the report was exaggerated in the press. FAAN said the clarification became necessary in light of insinuations on what happened at the airport on Monday. 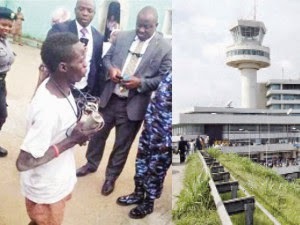 A statement issued by the General Manager, Corporate Communications, FAAN, Mr. Yakubu Dati, said the young man arrested at the airport was loitering around the premises, which attracted the attention of security personnel. Dati said, “The suspect, a man in his late 20s was arrested at an area of the airport close to the church of the airport internal link road, leading to the Stakeholders/Limousine car park. That is a distance of about one kilometre to the international terminal. “At the time of his arrest, the suspect was said to be loitering around the said area all morning. This attracted the curiosity of security guards on duty at the entrance of the Nigerian Airspace Management Agency’s CENTREX Facility located along the airport internal link road, who promptly alerted the police. “The suspect was alleged to be in possession of a device suspected to be used in making explosives. He was promptly handed over to the Airport Police Command for interrogation. While we appreciate the need to promptly report all suspicious characters to security agencies, it is important to always cross check the facts before going to press, to avoid sending the wrong signals to the public. “The issue of safety and security of the airport has remained our priority and the various security agencies are collaborating with us for a secure and safe environment. “The Federal Airports Authority of Nigeria therefore wishes to reassure passengers and other airport users of adequate security architecture at MMA as well as its avowed commitment to making safety and security top priority at all times”, the statement said.